The Milwaukee County Zoo’s Aquatic and Reptile Center has a new female giant Pacific octopus. 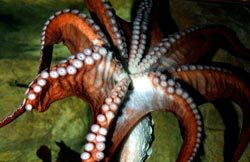 The giant Pacific octopus is the largest octopus species in the world, weighing up to 33 pounds, and growing from tentacle tip to tentacle tip, to 7-feet-long for females and 14-feet-long for males. 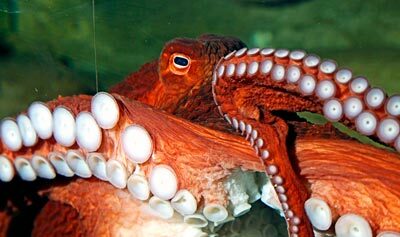 Octopuses have muscles that control each of the individual suckers on their arms. Female octopuses have 280 suckers on each arm. The suckers have chemical receptors allowing the octopus to taste and touch. Even more interesting is that octopuses have chromatophores in their skin cells that allows their skin to change colors based on moods, breeding behaviors and camouflage needs. The female octopus lays anywhere from 20,000 to 100,000 eggs. She stays with the eggs, without feeding, until they hatch seven months later. She dies shortly after her eggs hatch. Males die shortly after breeding. Our octopus will not have contact with a male so any eggs she lays will be infertile. Our octopus is fed a diet of herring, squid, mussels, shrimp and crab. She appears intrigued by her Rubik’s Cube, Mr. Potato Head and Wiffle ball enrichment items. She grabs, manipulates and moves the items around in her tank. Although she is known to hide behind things in her exhibit, look for her daily in the Octopus Exhibit located in the Aquatic and Reptile Center.